The Soft Coated Wheaten is a relatively new breed having been officially named and recognised in Eire its country of origin as late as 1937, although the folklore of Ireland suggests that blonde terrier type dogs were commonplace on farms back into the mists of time. To confuse everyone when searching online in google etc you will come across Irish Soft Coated Wheatens as well as Soft Coated Wheatens but don’t worry they are one and the same breed. The original name was changed several years ago in Eire to include the word Irish and this new name was adopted around the world except in the UK, USA and a few other countries where the original name has been retained. Information is freely available online about the breed so we will restrict our text to info pertinent to those of you interested in owning a wheaten for the first time. 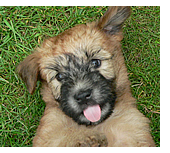 As a family pet the wheaten has few peers being very much a people dog thriving on human companionship. He is highly inquisitive and just loves to follow you around no matter what you are doing. On meeting someone for the first time or when you are returning home he tends to be a little exhuberant, welcoming his human friend excitedly ….. this welcome lasting for a few minutes before calm ensues. He is not a small dog being of medium size, as an adult approximately 18 to 20 ins (45 to 51 cms ) in height to the shoulder and 35 to 45 lbs ( 16 to 24.5 Kg ) in weight. In general wheatens are not fussy eaters and as adults will have one or two meals per day to fit in with your lifestyle. We normally recommend a food which will provide him with everything he needs. You won’t have missed the fact that a wheaten has an attractive long soft coat normally falling in waves or loose curls and it goes without saying that the coat requires regular attention to maintain its health and appearance. The coat does not shed or cast and this necessitates regular combing or unmanageable, unsightly and uncomfortable matting occurs. Thorough combing is required on a weekly basis for an adult and will take around one to two hours per week. 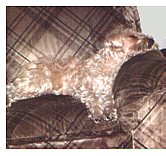 Over the years we have found that the majority of allergy sufferers can co-habit comfortably with a wheaten showing little or no reaction and this is due to the coat not casting. An added bonus is that your clothes, home furnishings etc do not get covered in hairs as is the case with most other breeds and cats. A wheaten will happily accept the level of exercise you want to give although it goes without saying that all dogs require regular exercise.